The first long weekend of the Canadian summer is almost upon us!! Are you excited? If you're anything like me, you're making plans to spend time outdoors as much as possible. 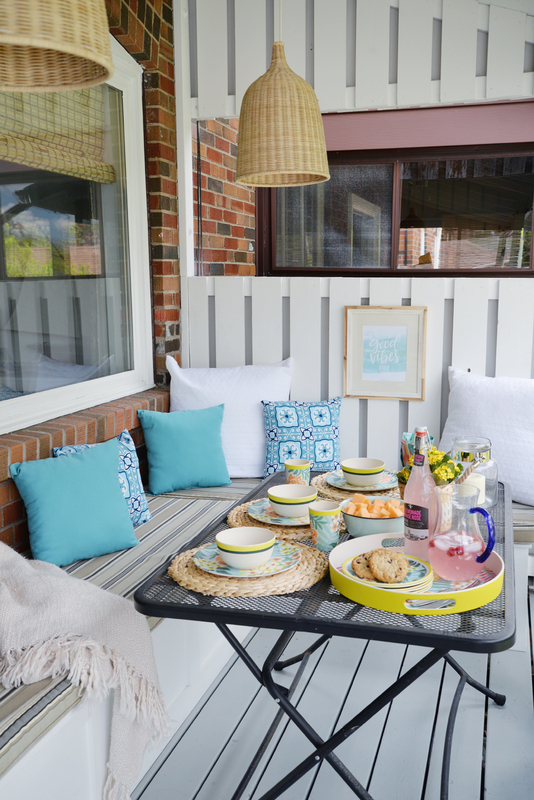 I'm really looking forward to meals al fresco and naps with the breezes blowing... time to get porch-ready! One place I love to be in the summer is on our back porch. It received a beachy makeover a few years ago but with a few changes in accessories, it's channelling the tropics this season. 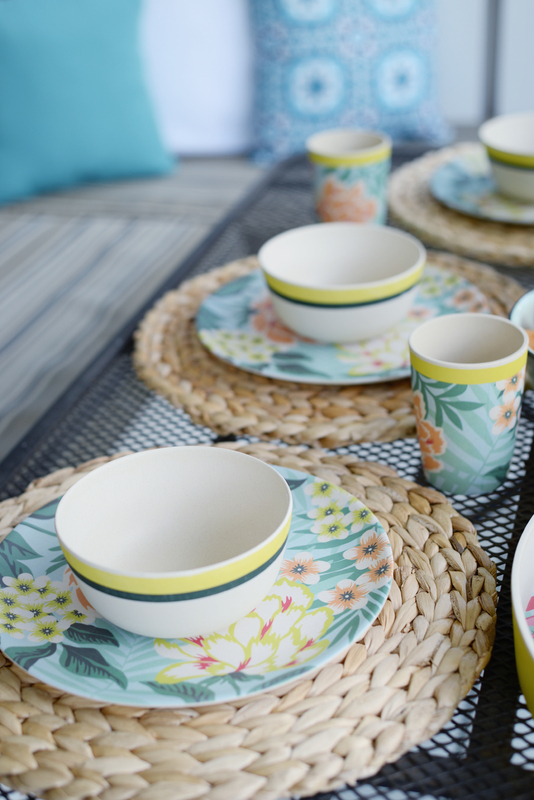 How fabulous are these plates and coordinating bowls? I love their vibrant colour and vintage tropical plant patterns, not to mention they're made from renewable resources and are dishwasher safe. 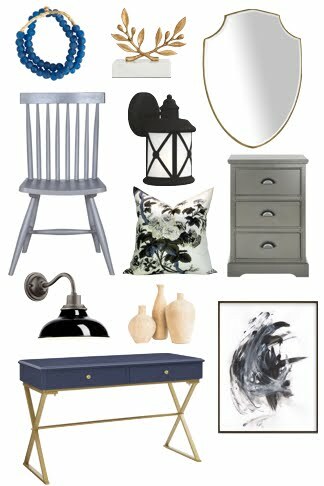 These plates are part of the PC® Bamboo Fibre Collection and I'm excited to be partnering with Real Canadian Superstore over the coming months to highlight some of their decor offerings. Given that my grocery budget is typically 50% food, 25% home decor, and 25% Joe Fresh, I'm excited to show you what Real Canadian Superstore has on offer. 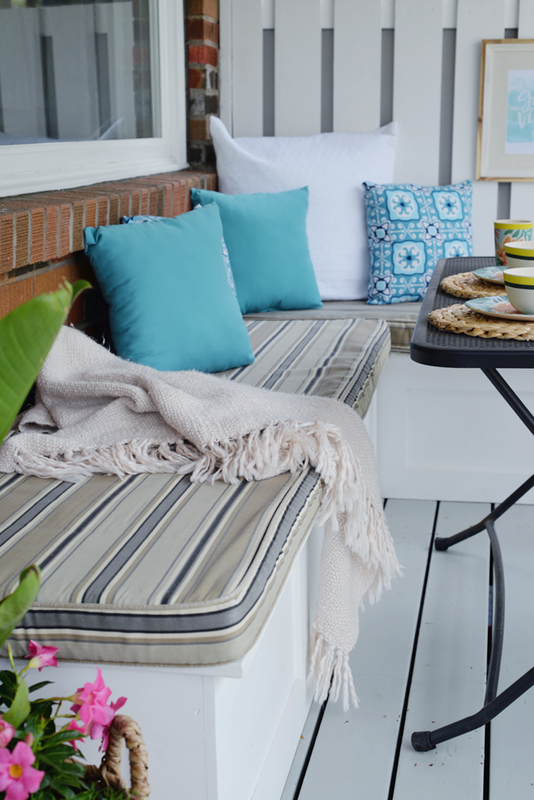 Adding new accents can liven up your outdoor space. I switched out some of our brown and black pillows for these bright aqua and white outdoor ones. They scream summer and make the porch seem brighter and more welcoming. 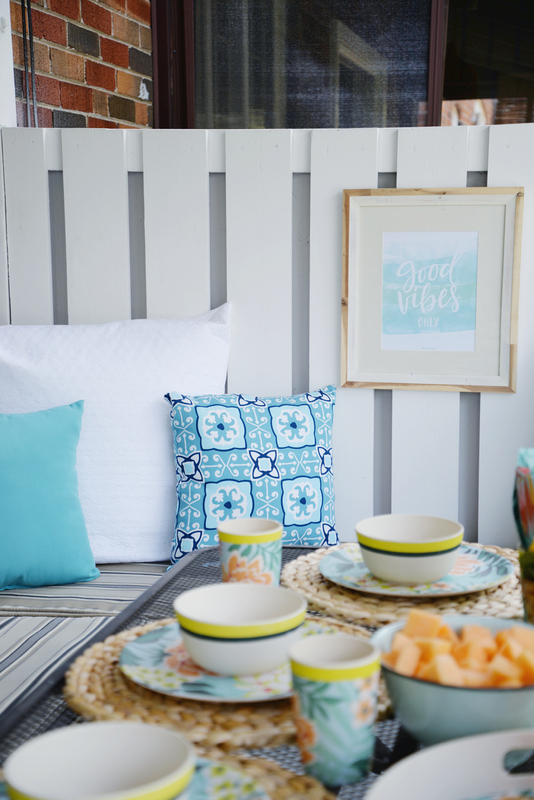 On the fence, I hung the Good Vibes Only print designed by Justine Ma for BlogPodium 2015 as it worked with colour palette. [Side note: we're already 40% sold for BlogPodium 2016 so grab your ticket now if you haven't already! Woot!]. Outdoor art can often be forgotten but adding pieces like my blurred beachy photo can make your space feel like a finished room. And what's an outdoor party without food? 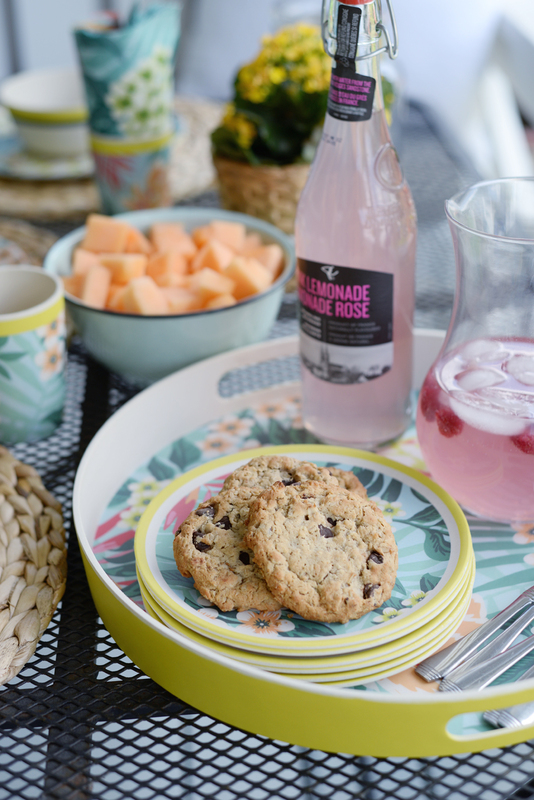 I can never resist the bakery soft cookies and the PC Black Label Pink Lemonade is my sparkly drink of choice for the summer. Love the round tray too. It's got an anti-slip bottom which makes it ideal for transporting drinks to the patio. I'm thrilled with how cheery the porch feels now. It carries the tropical feeling of our dining room, right on the other side of that window, outdoors. Who's ready to join me for drinks? Disclosure: This post was sponsored Real Canadian Superstore. 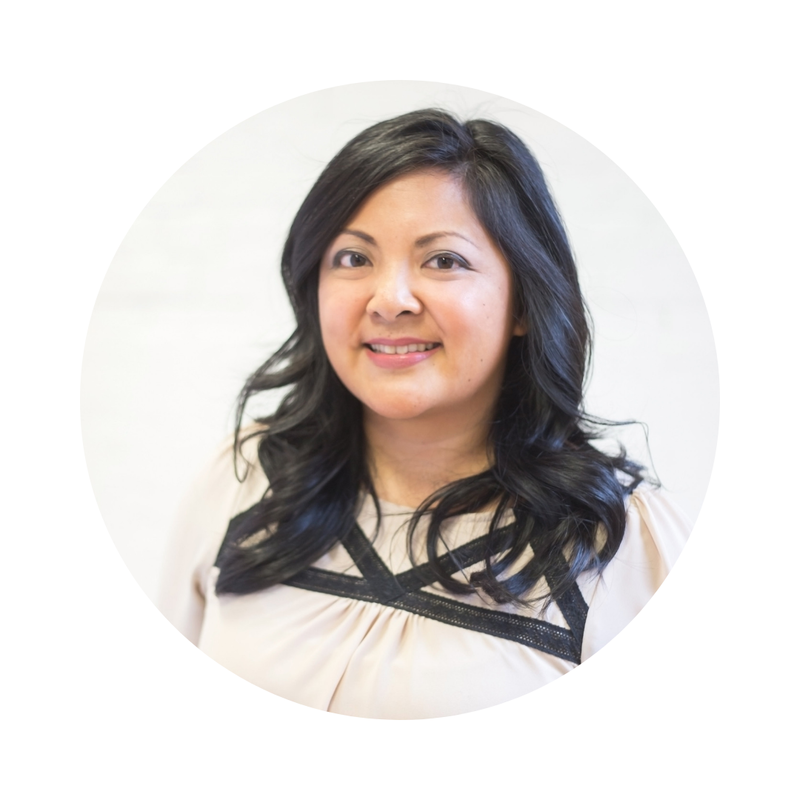 Thank you for supporting the brands that I love and bring into my own home, who make this blog possible.